KOLWEZI, DEMOCRATIC REPUBLIC OF CONGO – Ivanhoe Mines (TSX: IVN; OTCQX: IVPAF) Executive Chairman Robert Friedland and Chief Executive Officer Lars-Eric Johansson today announced assay results from another 43 holes as part of the ongoing 2017 drilling campaign at the company’s Tier One Kamoa-Kakula Copper Project, near the mining centre of Kolwezi in the Democratic Republic of Congo (DRC). Exploration drilling at Kakula West, located on the western end of the currently defined high-grade, essentially flat-lying Kakula mineralized trend that now extends at least 12 kilometres (Figure 1), has confirmed a significant area of mineralization with characteristics and grades similar to the high-grade Kakula Mineral Resource area located to the east. 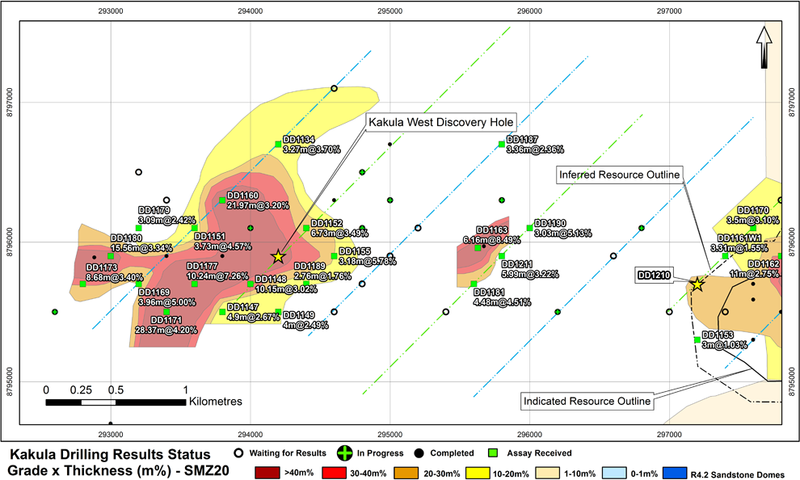 An area of two kilometres by one kilometre already has been drilled off at Kakula West on an approximate 300-metre grid pattern, while the drilling in the “saddle” area between Kakula West and Kakula is rapidly being in-filled in preparation for an updated resource estimate for the Kakula Discovery expected by the end of this year. The Kakula Discovery continues to remain open along a westerly-southeasterly strike. Based on recent drilling results at Kakula, and given the impressive continuity of the high-grade mineralization seen to date, Ivanhoe’s geologists expect that by this October drilling will have expanded the delineated strike extent of the area encompassing Indicated and Inferred Mineral Resources by approximately 60%, and that the Kakula and Kakula West deposits will form a continuous mineral resource area. “We’re looking forward to providing our shareholders and all Kamoa-Kakula stakeholders with another substantial resource expansion for the coming holiday season,” said Mr. Friedland. 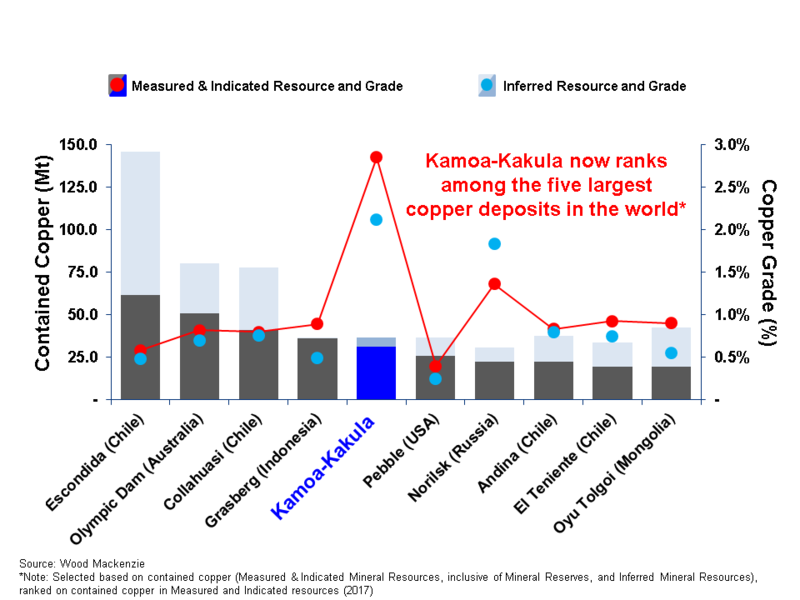 “Kamoa-Kakula already is independently ranked as the fifth-largest copper deposit in the world. Seeing the unprecedented rate of growth of high-grade copper resources since drilling began at Kakula in May 2016, I am confident now that soon it will be among the top three. 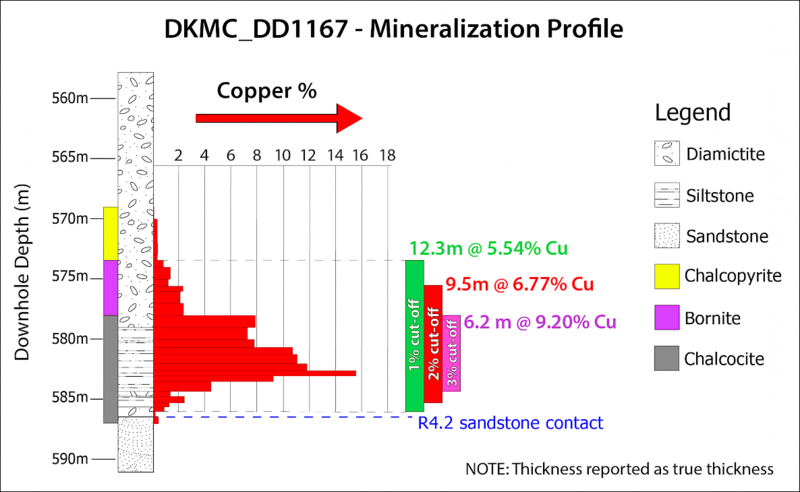 “The remarkable consistency of the ultra-high-grade copper mineralization at the Kakula Discovery is unlike anything geologists have ever seen in the DRC’s Copperbelt. The discovery remains open in virtually all directions, so the real question is, how much bigger and better is Kakula going to get?” Mr. Friedland added. 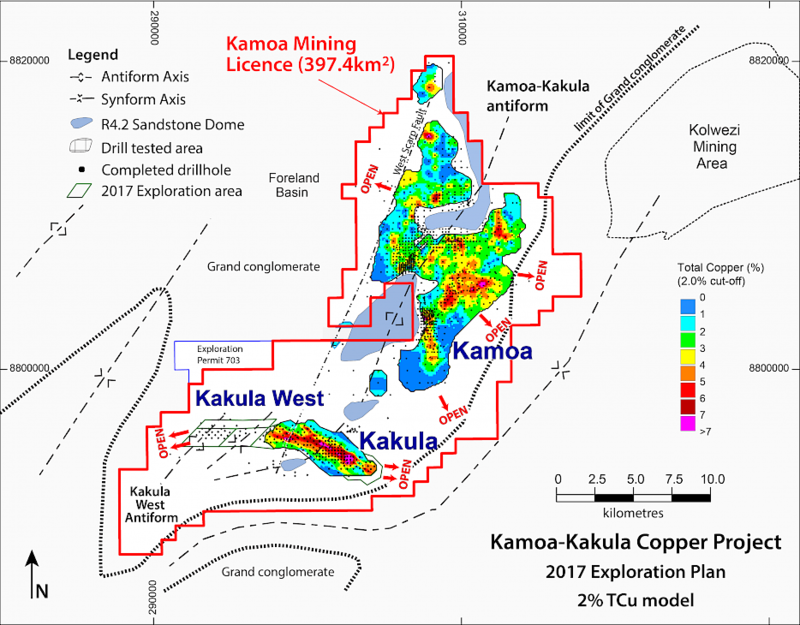 Exploration results at Kakula West confirm a significant, high-grade copper discovery. A total of 17,500 metres of drilling in 31 holes has been completed since the May 2017 resource update; assays have been received for 20 holes. Drilling results now have defined a high-grade mineralized zone with a width of at least 1.0 kilometre and a strike extent of more than 2.9 kilometres. 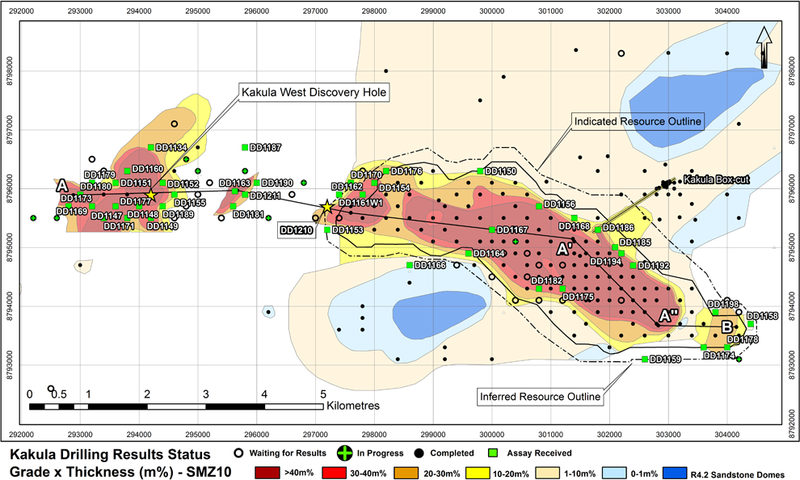 Results from drill holes in the saddle area between Kakula West and the Kakula resource area also have returned extremely significant values, confirming the continuity of the Kakula high-grade zone between the two areas. 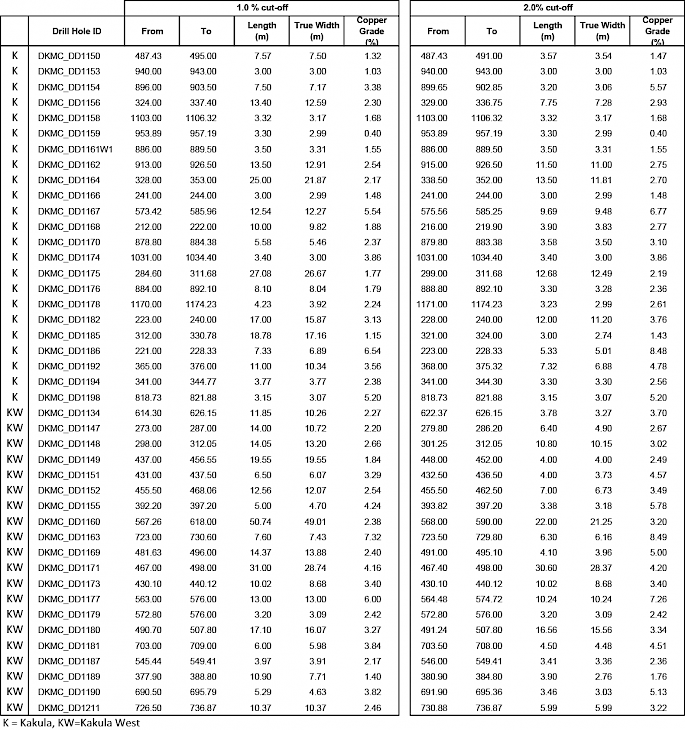 A complete list of assays for the new drill holes is contained in Table 1. DD1160, drilled on northern side of Kakula West, intersected 8.69 metres (true width) of 4.23% copper at a 3.0% copper cut-off, beginning at a downhole depth of 580.00 metres; 11.59 metres (true width) of 3.85% copper at a 2.5% copper cut-off; 21.25 metres (true width) of 3.20% copper at a 2% copper cut-off; and 49.01 metres (true width) of 2.38% copper at a 1% copper cut-off. DD1163, drilled in the saddle area between Kakula and Kakula West, intersected 5.28 metres (true width) of 9.54% copper at a 3.0% copper cut-off, beginning at a downhole depth of 724.40 metres; 5.28 metres (true width) of 9.54% copper at a 2.5% copper cut-off; 6.16 metres (true width) of 8.49% copper at a 2% copper cut-off; and 7.43 metres (true width) of 7.32% copper at a 1% copper cut-off. DD1171, drilled at the currently defined south-western limit of Kakula West, intersected 26.05 metres (true width) of 4.37% copper at a 3.0% copper cut-off, beginning at a downhole depth of 469.50 metres; 26.05 metres (true width) of 4.37% copper at a 2.5% copper cut-off; 28.37 metres (true width) of 4.20% copper at a 2% copper cut-off; and 28.74 metres (true width) of 4.16% copper at a 1% copper cut-off. DD1177, drilled in the centre of Kakula West, intersected 9.62 metres (true width) of 7.57% copper at a 3.0% copper cut-off, beginning at a downhole depth of 565.10 metres; 9.62 metres (true width) of 7.57% copper at a 2.5% copper cut-off; 10.24 metres (true width) of 7.26% copper at a 2% copper cut-off; and 13.00 metres (true width) of 6.00% copper at a 1% copper cut-off. DD1180, drilled on the currently defined western limit of Kakula West, intersected 5.17 metres (true width) of 5.39% copper at a 3.0% copper cut-off, beginning at a downhole depth of 492.40 metres; 11.65 metres (true width) of 3.74% copper at a 2.5% copper cut-off; 15.56 metres (true width) of 3.34% copper at a 2% copper cut-off; and 16.07 metres (true width) of 3.27% copper at a 1% copper cut-off. Exploration activities since the May 17, 2017, resource update have focused on extending the resources to the southeast and to the northwest, as well as in-fill drilling on the inferred and indicated resources areas ahead of the upcoming pre-feasibility study. A total of 26,700 metres in 44 holes have been completed in the Kakula resource area, of which assays for 23 holes now have been received. DD1167, an in-fill hole drilled in the northwest portion of Kakula, intersected 6.16 metres (true width) of 9.20% copper at a 3.0% copper cut-off, beginning at a downhole depth of 578.00 metres; 6.16 metres (true width) of 9.20% copper at a 2.5% copper cut-off; 9.48 metres (true width) of 6.77% copper at a 2% copper cut-off; and 12.27 metres (true width) of 5.54% copper at a 1% copper cut-off. 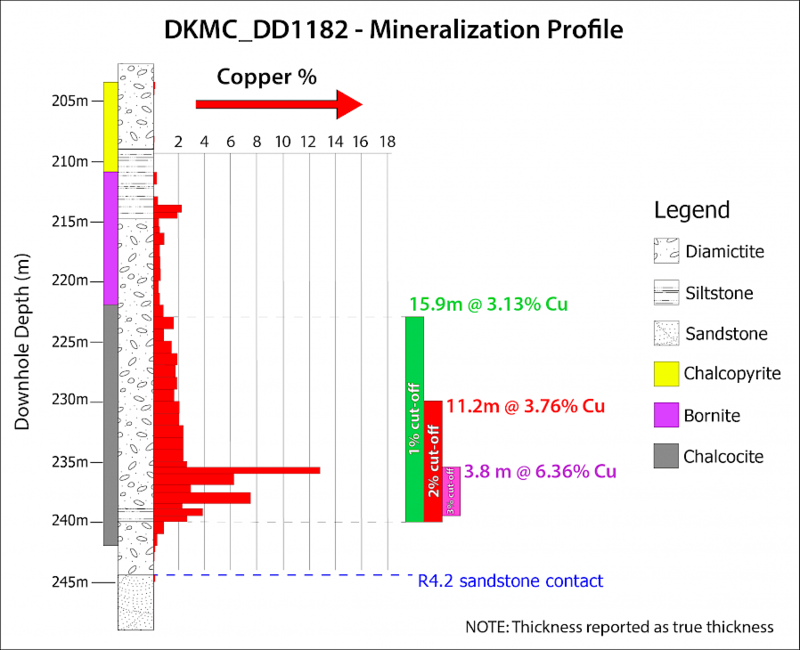 DD1182, drilled on the south-western limit of the Kakula resource area, intersected 3.75 metres (true width) of 6.36% copper at a 3.0% copper cut-off, beginning at a downhole depth of 235.48 metres; 7.47 metres (true width) of 4.56% copper at a 2.5% copper cut-off; 11.20 metres (true width) of 3.76% copper at a 2% copper cut-off; and 15.87 metres (true width) of 3.13% copper at a 1% copper cut-off. 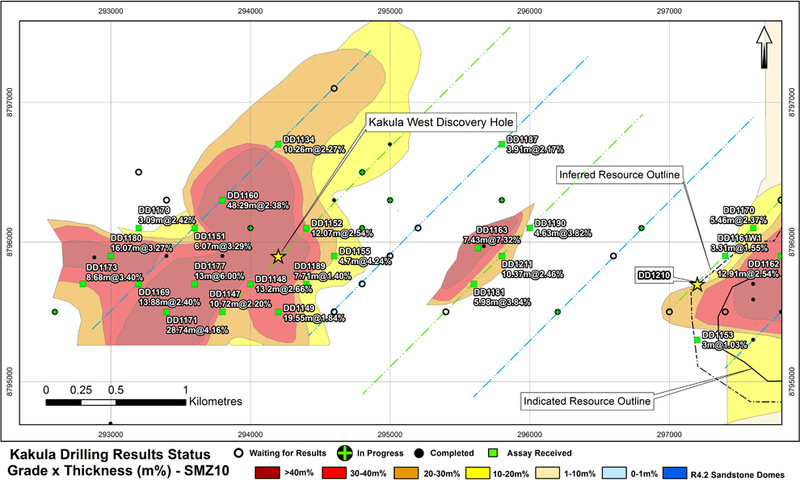 Figure 1: Kamoa-Kakula Copper Project geology showing the Kakula resource area and Kakula West, which is open for significant expansion along trend to the west. Results from ongoing drilling, combined with results from drill holes completed to date, will form the basis of the planned updated resource estimate. The current exploration plan should achieve sufficient drilling by October to allow the definition of resources over an area encompassing the entire strike length of the Kakula Discovery, which now extends to at least 12 kilometres. This would represent an increase of approximately 60% in the strike length that will be used to calculate the new resource estimate, as compared to the 7.7-kilometre strike length covered by Kakula’s May 2017 resource estimate. The updated resource estimate is expected to be finalized before the end of this year and will incorporate results from drill holes completed by the end of October. At Kakula West, an area of approximately two kilometres by one kilometre already has been in-fill drilled, and it is intended that this in-filled area will expand to both the west and east with ongoing drilling. Drilling on a minimum spacing of 800 metres by 300 metres is expected to be completed in the central saddle area in October, which should be sufficient to delineate Inferred Resources in this area. In response to the unprecedented exploration success at Kakula, Ivanhoe Mines and Zijin Mining are continuing with the accelerated exploration program. Fourteen rigs are drilling on the Kamoa-Kakula project area: 11 in the Kakula Discovery area; one drilling in the Kamoa Nord target area; one drilling to the south of Kakula exploring the Mulamena target; and one conducting sterilization drilling in areas planned for mine infrastructure development. Of the 11 rigs drilling at the Kakula Discovery, five are conducting exploration and in-fill drilling at Kakula West; three are drilling in the saddle area between the Kakula resource area and Kakula West; two are conducting in-fill drilling in the Kakula resource area; and one is continuing to test the southeastern extension of the Kakula mineralized trend. More than 80,000 metres of drilling have been completed at Kamoa-Kakula to date in 2017, including a number of the new target areas, several of which have returned encouraging initial results. Additional, follow-up drilling is planned for these target areas as drills become available. The May 2017 Kakula Mineral Resource estimate was prepared by Ivanhoe Mines under the direction of Dr. Harry Parker and Gordon Seibel, both RM SME, of Amec Foster Wheeler, of Reno, Nevada, in accordance with the 2014 CIM Definition Standards for Mineral Resources and Mineral Reserves. Indicated Mineral Resources total 349 million tonnes at a grade of 3.23% copper,containing 24.9 billion pounds of copper at a 1% copper cut-off. At a 2% copper cut-off, Indicated Mineral Resources total 210 million tonnes at a 4.41% copper grade,containing 20.4 billion pounds of copper. At a higher cut-off of 3% copper, Indicated Mineral Resources total 116 million tonnes at a grade of 6.09% copper, containing15.6 billion pounds of copper. Inferred Mineral Resources total 59 million tonnes at a grade of 2.26% copper,containing 3.0 billion pounds of copper at a 1% copper cut-off. At a 2% copper cut-off,Inferred Mineral Resources total 27 million tonnes at a 3.19% copper grade,containing 1.9 billion pounds of copper. At a higher cut-off of 3% copper, InferredMineral Resources total 12 million tonnes at a grade of 4.45% copper, containing 1.1billion pounds of copper. 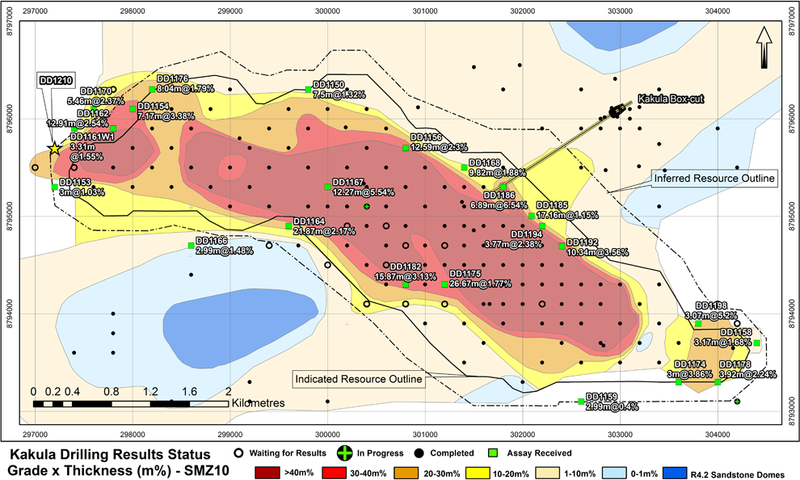 The average true thickness of the selective mineralized zone (SMZ) at a 1% cut-off is12.0 metres in the Indicated Mineral Resources area and 6.4 metres in the InferredMineral Resources area. 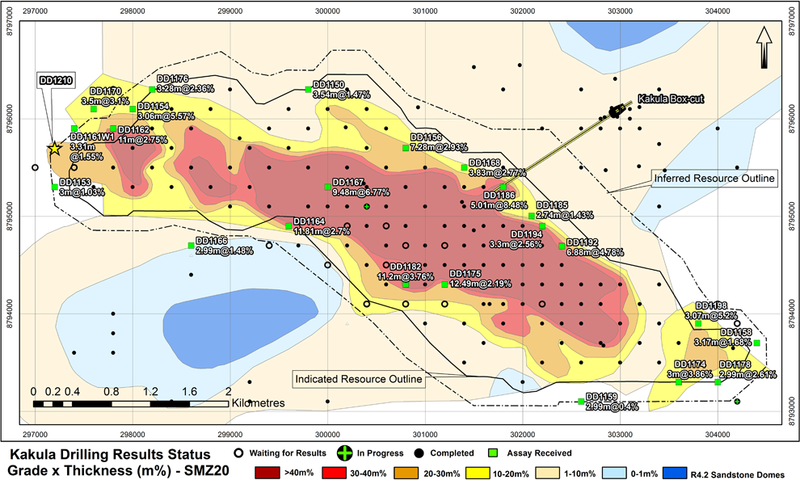 At a higher 3% cut-off, the average true thickness of the SMZis 5.3 metres in the Indicated Mineral Resources area and 3.9 metres in the InferredMineral Resources area. The combined Kamoa-Kakula Indicated Mineral Resources total approximately one billion tonnes grading 3.02% copper, containing 66 billion pounds of copper, plus another 191 million tonnes of Inferred Resources at 2.37% copper, at a 1.4% copper cut-off grade. Figure 2. Kamoa-Kakula, among the world’s largest copper deposits by contained copper, also has the highest copper grades by a wide margin. *Note: Selected based on contained copper (Measured & Indicated Mineral Resources, inclusive of Mineral Reserves, and Inferred Mineral Resources), ranked on contained copper in Measured and Indicated resources (2017). 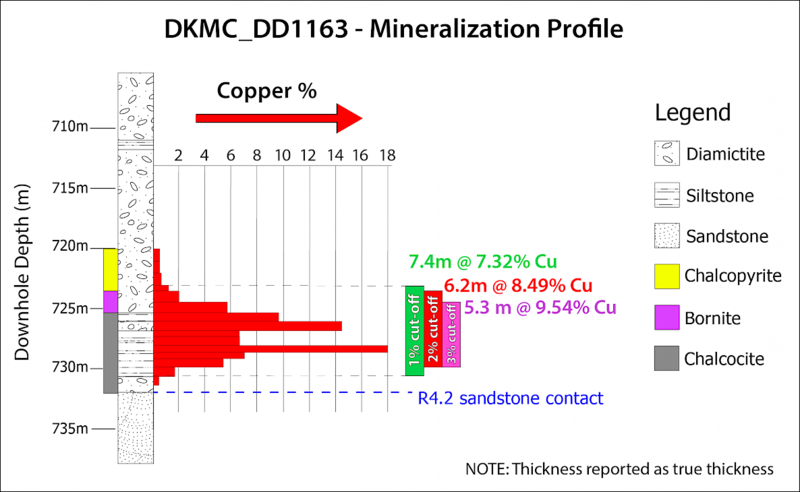 Copper mineralization at Kakula and Kakula West is consistently bottom-loaded and will support the construction of SMZ composites at cut-offs up to at least 3% copper. The lateral consistency of mineralization at these higher cut-offs presents significant opportunities for mine planning, with large areas of the resource having chalcocite-rich mineralization with average grades in excess of 6% when using the 3% SMZ. 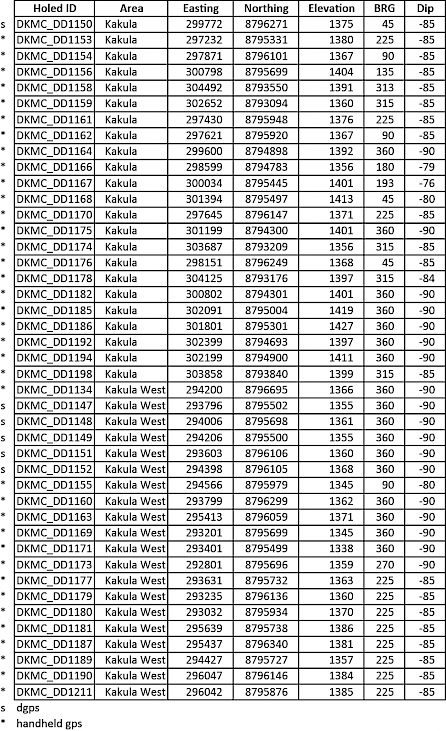 Below are strip logs for five of the drill holes reported in this release: DD1163, on the eastern edge of Kakula West; DD1171, on the southwestern edge of Kakula West; DD1160, on the northern side of Kakula West; DD1167, on the northwest portion of the Kakula resource area; and DD1182, on the southwestern limit of the Kakula resource area. 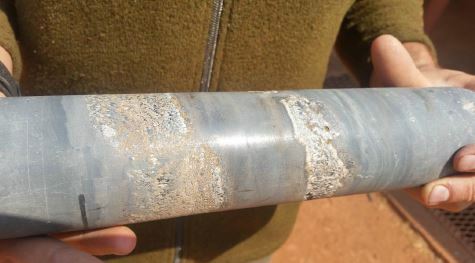 Chalcocite-rich drill core at a depth of 938 metres from DD1210 drilled at the western edge of the Kakula resource area. Chalcocite (copper sulfide, Cu2S) is opaque and dark-grey to black, with a metallic lustre. Due to its very high percentage of contained copper by weight (the percentage of the mineral that is actual metal to be extracted is 80% copper by weight) and its capacity to produce an exceptionally clean, high-grade concentrate, chalcocite is considered to be the most valuable copper mineral. Mr. Johansson said that the preliminary economic assessment (PEA) examining expanded production scenarios at Kamoa-Kakula is progressing well and is expected to be released in the fourth quarter. The new PEA is considering a mine capacity of approximately six million tonnes per annum (Mtpa) at Kakula and a similar sized mine at Kansoko Sud, giving the revised PEA a projected peak mine production of approximately 12 Mtpa. In addition to the new PEA study, Mr. Johansson said that work on a six-Mtpa pre-feasibility study (PFS) at Kakula is well underway. The PFS will be considered as the base case for the first phase of planned development at Kamoa-Kakula. “In light of the successful drilling at Kakula West, the development plans will be reassessed and amended as the project moves forward,” said Mr. Johansson. “Ultimately, we see the potential for an additional mining centre at Kakula West, which could increase the ultimate mining rate at Kamoa-Kakula to at least 18 Mtpa, through a number of phased expansions. Figure 3. Drill-hole location plan for the Kakula resource area and Kakula West showing holes completed and in progress, and the Kakula box cut (at right), superimposed on 1% composite grade thickness contours. on 1% composite grade thickness contours. on 2% composite grade thickness contours. Figure 6. Drill-hole location plan showing grade and thickness of recent drilling results at Kakula resource area superimposed on 1% composite grade thickness contours. Kakula box cut is shown at upper right. on 2% composite grade thickness contours. The Kakula box cut shown in upper left corner. 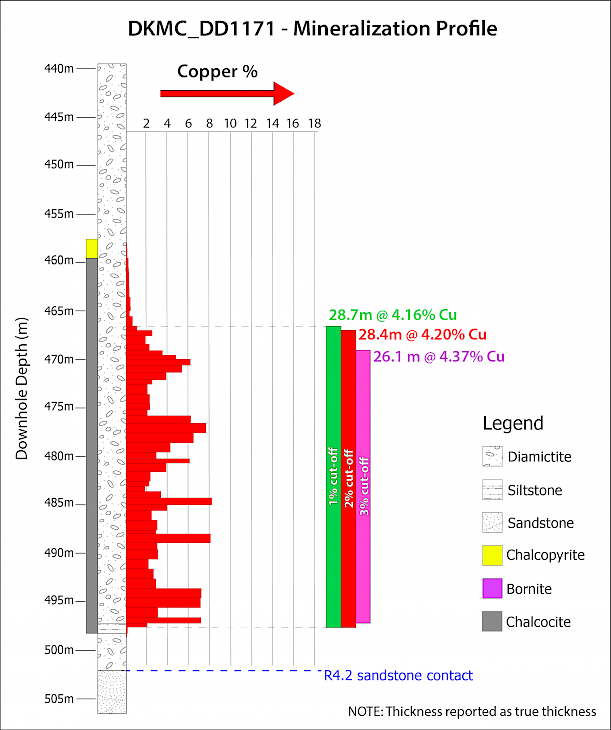 to date and composites at a 3% copper cut-off. The Kakula Deposit, as illustrated above, is a gently-dipping blanket of thick, chalcocite-rich copper mineralization. Initial mine development is planned to begin in the flat, near-surface zone highlighted in the inset on the right, which at a 3% cut-off is between 7.1 metres and 11.7 metres thick and with copper grades of between 8.11% and 10.35% along the deposit’s axis. Table 1. Assay composites at 1.0% and 2.0% copper cut-offs. Table 2. 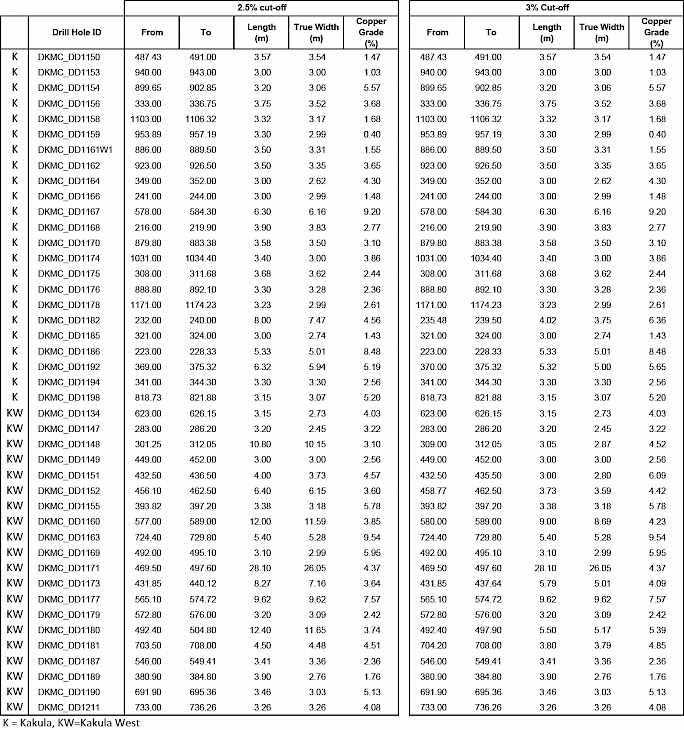 Assay composites at 2.5% and 3.0% copper cut-offs. Table 3. Collar locations of holes reported with assays. The Kamoa-Kakula Project is a very large, stratiform copper deposit with adjacent prospective exploration areas within the Central African Copperbelt, located approximately 25 kilometres west of the town of Kolwezi and about 270 kilometres west of Lubumbashi. 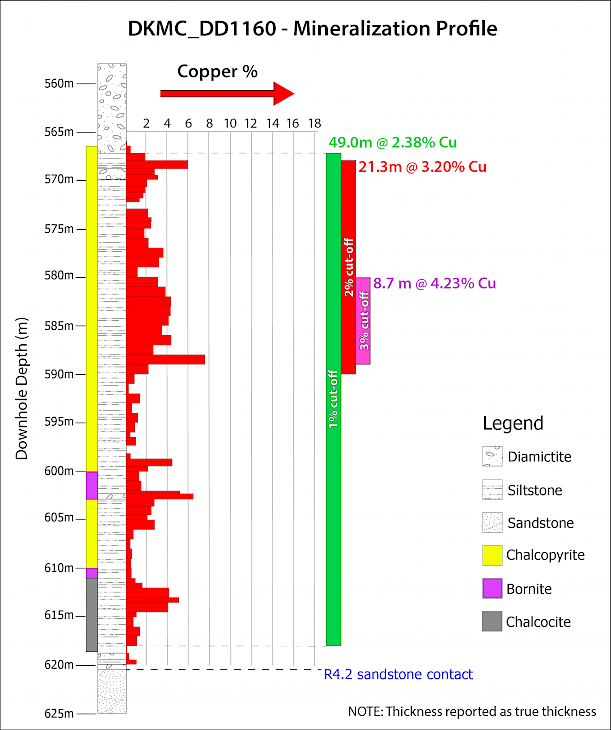 The Kamoa Copper Deposit was discovered by Ivanhoe Mines (then named Ivanhoe Nickel & Platinum) in 2008, followed by the discovery of the Kakula Deposit in early 2016. Based on a May 2017 Mineral Resource estimate prepared under the direction of Dr. Harry Parker and Gordon Seibel of Amec Foster Wheeler, the combined Kamoa-Kakula Indicated Mineral Resources total approximately one billion tonnes grading 3.02% copper, containing 66 billion pounds of copper, plus another 191 million tonnes of Inferred Resources at 2.37% copper, at a 1.4% copper cut-off grade. In August 2012, the DRC government granted mining licences to Ivanhoe Mines for the Kamoa-Kakula Project that cover a total of 397 square kilometres. The licences are valid for 30 years and can be renewed at 15-year intervals. Mine development work at the project began in July 2014 with construction of a box cut for the decline ramps for the planned Kansoko Sud Mine. Ivanhoe Mines and Zijin Mining each hold an indirect 39.6% interest in the Kamoa-Kakula Project, Crystal River Global Limited holds an indirect 0.8% interest and the DRC government holds a direct 20% interest. The scientific and technical information in this release has been reviewed and approved by Stephen Torr, P.Geo., Ivanhoe Mines’ Vice President, Project Geology and Evaluation, and a Qualified Person under the terms of National Instrument 43-101. Mr. Torr, who is not independent of Ivanhoe Mines, has verified the technical data disclosed in this news release. Ivanhoe Mines maintains a comprehensive chain of custody and QA-QC program on assays from its Kamoa-Kakula Project. Half-sawn core is processed at Kamoa-Kakula’s on-site preparation laboratory and prepared samples then are shipped by secure courier to Bureau Veritas Minerals (BVM) Laboratories in Australia, an ISO17025-accredited facility. Copper assays are determined at BVM by mixed-acid digestion with ICP finish. Industry-standard certified reference materials and blanks are inserted into the sample stream prior to dispatch to BVM. For detailed information about assay methods and data verification measures used to support the scientific and technical information, please refer to the Kakula 2017 Resource Update, June 2017 technical report available on the SEDAR profile of Ivanhoe Mines at www.sedar.com or under technical reports on the Ivanhoe Mines website at www.ivanhoemines.com. Certain statements in this release constitute “forward-looking statements” or “forward-looking information” within the meaning of applicable securities laws, including without limitation: (1) statements regarding the preparation of an updated resource estimate for the Kakula Discovery by the end of 2017; (2) statements regarding that by this October drilling will have expanded the delineated strike extent of the Mineral Resources by approximately 60%, and the Kakula and Kakula West deposits will form a continuous mineral resource area for the new resource estimate; (3) statements regarding the new drilling results, together with results from holes pending, are expected to result in major upgrade and expansion of the Kakula Mineral Resource; (4) statements regarding the expectation that given the unprecedented rate of growth of high-grade copper resources since drilling began at Kakula in May 2016, Kamoa-Kakula soon will be ranked in the top three of the world’s largest copper deposits; (5) statements regarding the current exploration plan should achieve sufficient drilling by October to allow definition of resources over an area encompassing the entire at least 12-kilometre Kakula Discovery zone; (6) statements regarding the intention that the in-filled area at Kakula West will expand to both the west and east with ongoing drilling during September; (7) statements regarding drilling on a minimum spacing of 800-metres by 300-metres will be completed in the central saddle area by October, which should be sufficient to delineate Inferred Resources in this area; (8) statements regarding Ivanhoe’s looking forward to soon providing its shareholders and all Kamoa-Kakula stakeholders with another substantial resource expansion; (9) statements regarding additional, follow-up drilling is planned for the target areas at Kamoa-Kakula as drills become available; (10) statements regarding the mineralization at Kakula and Kakula West is consistently bottom-loaded and will support the construction of selective, mineralized zone composites at cut-offs up to at least 3% copper; (11) statements regarding the preliminary economic assessment examining expanded production scenarios at Kamoa-Kakula is expected to be released in the fourth quarter; (12) statements regarding the potential for an additional mining centre at Kakula West, which could increase the ultimate mining rate at Kamoa-Kakula to at least 18 Mtpa, through a number of phased expansions; and (13) statements regarding initial mine development at Kakula is planned to begin in the flat, near-surface zone which, at a 3% cut-off, is between 7.1 metres and 11.7 metres thick and with copper grades between 8.11% and 10.35% along the deposit’s axis. This news release also contains references to estimates of Mineral Resources. The estimation of Mineral Resources is inherently uncertain and involves subjective judgments about many relevant factors. Mineral Resources that are not Mineral Reserves do not have demonstrated economic viability. The accuracy of any such estimates is a function of the quantity and quality of available data, and of the assumptions made and judgments used in engineering and geological interpretation, which may prove to be unreliable and depend, to a certain extent, upon the analysis of drilling results and statistical inferences that may ultimately prove to be inaccurate. Mineral Resource estimates may have to be re-estimated based on, among other things: (i) fluctuations in copper or other mineral prices; (ii) results of drilling; (iii) results of metallurgical testing and other studies; (iv) changes to proposed mining operations, including dilution; (v) the evaluation of mine plans subsequent to the date of any estimates; and (vi) the possible failure to receive required permits, approvals and licences.